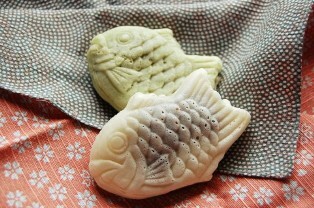 Taiyaki ('たい焼き', is classified into sweets), is known as Fish-shaped Cake in English, and 鲷鱼烧 (Diāoyú shāo) in Chinese. It is the Japanese style sweets. Wheat Flour, Sugar, Baking Soda. Salt, Azuki Beans Paste, Chocolate, Caramel, Custard Cream.